Below is the basic timeline if everything is done in perfect order. It is often longer than this and may be delayed or actively blocked by a number of factors (HAMP/HAFA application, bankruptcy, government issued temporary moratoriums, etc). You can contact me at 916-719-6161 or Email at frank@frankvernirealtor.com to review your specific situation and options. Even though a borrower may be proceeding with a short sale and the bank may be aware of that fact, the bank typically will not halt foreclosure proceedings. This is to protect their own interests and ability to move forward with the foreclosure with all expediency should the short sale fail. The foreclosure process is highly regulated and proper procedure must be followed. With all of the past media around “robosigners”, we are seeing the shortcuts attemped in this process beginning to backfire on the banks that did not follow the rules. In many cases, the California the Homeowners Bill of Rights can prevent the foreclosure from happening while the file is under review. Should the foreclosure reach the point where the property is scheduled to auction, most banks will delay the auction as long as a valid offer is being reviewed by their Loss Mitigation Department. However, your agent will need to track those dates and actively call to request the forebearance. Unfortunately, all of this means that collection calls will typically continue as the Collection Department does not talk to the Loss Mitigation Department (Short Sale Department), nor do they care. Please be aware that many collectors will do anything to get money out of your pocket, including referencing the short sale and saying that their bank will not process the sale without funds from you. This is absolutely untrue! More importantly, there is a statue of limitations as to how long the bank can pursue you for the balance. 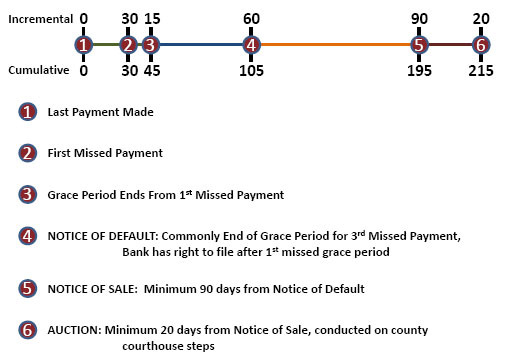 In California, that statute is 4 years from your last payment (see an attorney to verify), and something as benign as a $20 payment to get them off the phone will completely restart that timeline. Should the short sale fail, that could give the bank significant extra time to come after you and keep it as an active debt on your credit record blocking you from future home loans!